Are you ready to firm up your skin? I know that I am always looking for ways to firm and tighten my body. I hate to say it, but it is not getting any easier as I age. Sure, I need to exercise more and firm from the inside out. I absolutely believe in that. However, I do know that my body is losing collagen every year. I need to give my body and skin as much help as I can. That is why I get excited about products like this Firming Elixir from Elina Organics. No, I do not expect miracles. However, I do know that I can help my skin to look its very best (which certainly includes firming it!). 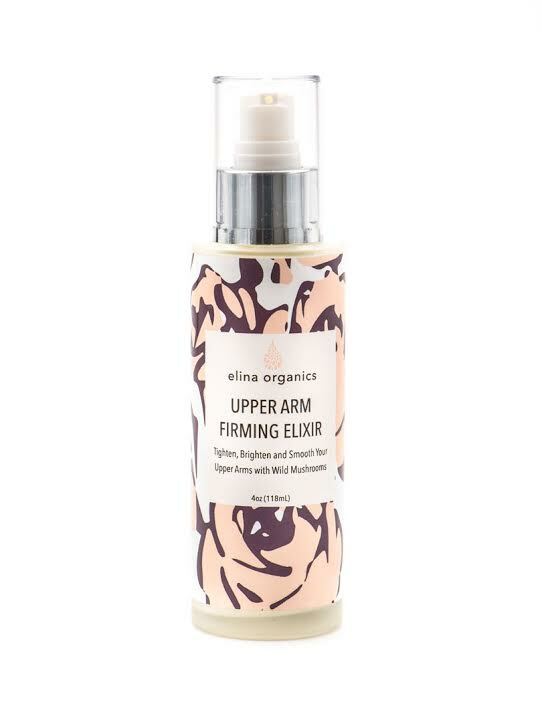 Introducing Elina Organics Upper Arm Firming Elixir! This product promises to tighten, brighten and smooth your upper arms with wild mushrooms – perfect for use on your legs and stomach too! This product gives 100% transdermal results while being organic, fresh, hand-made, and cruelty free. What is not to love there? 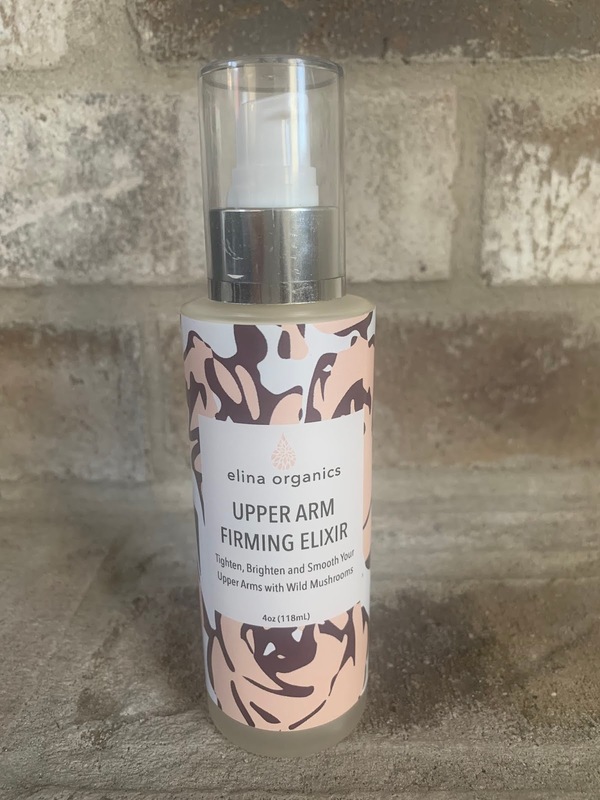 This product is a bio energized skin elixir which contains a powerful blend of wild mushrooms and herbs to tighten and rejuvenate the upper arms. The best part? It can be used all over your body as a firming and rejuvenating cream for areas like the stomach and legs. Key ingredients include white Truffle Extract and Shiitake Mushrooms: These ingredients both have a number of anti-aging and skin rejuvenating benefits. In addition to a high concentration of vitamins and anti-oxidants, they deliver a deeply hydrating effect. All of the active ingredients are encapsulated in liposomes for deep delivery into the live skin cells. Natural Peptides also help to speed up collagen and elastin regeneration. The gentle aroma of the lotion comes from precious botanicals and boswellia carterii frankincense essential oil from Somalia. The formulation is preserved naturally by fermented vegetables. White Truffle Extract – It is considered the “Queen” of all truffles and comes from Northern Italy. It contains a complete Vitamin B complex along with niacin. This helps to balance cellular metabolism and is very important for DNA repair. White truffle extract is also very conditioning, moisturizing, and protecting. Truffles have a wonderful combination of essential fatty acids which help to support and firm the skin as well as Vitamin A, C, and D. White Truffles have a higher concentration of vitamins and amino acids than other types of truffle. They naturally stimulate the renewal process of the skin. They also help to detoxify by supporting superoxide dismutase (an antioxidant enzyme found in all living cells). Chaga Mushrooms – Growing naturally on Birch trees, they have been used for health and beauty for centuries and contain one of the highest levels of antioxidants comparative to other mushrooms. They have superb skin restoring properties and work well with the other mushrooms in the formulation to firm and deeply rejuvenate your upper arms. Gingko Biloba – It has a unique combination of anti-oxidants and phytonutrients that help to increase microcirculation. Coffee Berries – They contain some caffeine which help to stimulate and detoxify the skin. It helps to bring more blood supply and supports skin cell regeneration. Yarrow – This helps to support blood vessels by making them more flexible. They also have a rejuvenating effect and help to improve elasticity of the skin. Sea Buckthorn Oil – This is the most efficient cocktail of beauty phytonutrients. It is a natural source of Beta Keratin pre-courser to Vitamin A and also Vitamin C and K, and a number of amino acids that help to firm skin. You can find this at Elina Organics here. Overall, I really enjoy using this Firming Elixir from Elina Organics. No, it is not a miracle product. However, no lotion, potion, nor cream is! I do feel that this elixir helps my skin look its best. Plus, I enjoy the scent and it is a delightful treat to use! I know that I am delivering fantastic ingredients to my skin.